Even though the U.S. Centers for Disease Control and Protection recommends that all adolescents receive a meningitis vaccination, there is no vaccine approved by the U.S. Food and Drug Administration to protect against meningitis B. In January, the European Commission authorized the meningitis B vaccine for use. Last month, the FDA approved the importation of the vaccine for students at Princeton where eight students have been treated for meningitis B this year. However, health officials have not approved the vaccine for use at UCSB where freshman Aaron Loy had his feet amputated as a result of being infected by meningitis. In the wake of Princeton University’s meningitis outbreak, healthy individuals on campus who are at risk for infection will be offered voluntary immunization with Bexsero (Novartis), a vaccine that has not been approved for use in the United States. Since March 22, 2013, health officials have confirmed eight cases of Neisseria meningitides serogroup B (MenB) meningitis among students and visitors at Princeton University. Bexsero is the only vaccine in production that protects against MenB. While the media have expressed concern about using an “experimental” vaccine on students, the authors of an article being published in Annals of Internal Medicine say “compassionate use” of the unlicenced vaccine is justified because epidemiologic evidence suggests that all Princeton University meningitis cases are related and that transmission is ongoing. 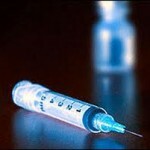 They argue that the vaccine is not experimental, as it has been approved for use in Europe and Australia. A plea for broader access to the vaccine has been made by advocacy groups, but the vaccine is being limited to Princeton University students based upon policy and epidemiology. While more than a third of total cases in the U.S. are due to MenB, a monovalent MenB vaccine would need to be administered along with the current quadrivalent conjugate meningococcal vaccine to optimize protection against all of the serogroups that cause the majority of disease in the U.S. The authors suggest that a vaccine that prevents MenB still should be available in the U.S. They write, “our ability to mobilize resources in response to this situation should compel us to take measures to ensure access to this prevention tool with proven safety and efficacy to all who are at risk.” Full text of this article is available at http://www.annals.org/article.aspx?doi=10.7326/M13-2927. We are writing with an update on the efforts to obtain approval to use a serogroup B meningococcal vaccine at UC Santa Barbara. The vaccine for serogroup B is currently licensed for use only in Europe, Australia and Canada. While we are reassured that no additional cases of meningococcal disease have occurred in community members since November 21, 2013, the nature of the disease and the cases at Princeton University this fall support moving forward with vaccination. The University has been working with the Center for Disease Control and Prevention (CDC) and state and local health officials to expedite access to the vaccine. Following a CDC site visit to campus earlier this month and a careful review of the historical epidemiology of the disease at our University and in the local community, the CDC with support from our University, Santa Barbara County Public Health Department and the California Department of Public Health, will be moving forward with an Investigational New Drug application (IND) with the Food and Drug Administration (FDA). Since this vaccine is not licensed in the United States, it is considered “investigational” and requires a special process in order to use it, similar to the one that took place at Princeton University earlier this fall. The IND would allow access to the serogroup B meningococcal vaccine for those identified by medical and health officials as being at increased risk. The University would offer the vaccinations to community members identified by the IND as being at increased risk. Although the process is continuing to move ahead as rapidly as possible, there are still many steps that need to take place, including determining the population to receive the vaccine. The CDC has posted a Q&A on their web site about the current situation at UC Santa Barbara and has a designated email for serogroup B vaccine questions. The health and well being of our students and campus community is our highest priority. We will continue to send out timely notices and post updates and additional information on our Student Health site as more specific information becomes available. We hope you have a safe and restful break and look forward to the start of the new quarter. UCSB and the CDC are “hoping” no more students get sick, basically waiting for more students to get meningitis before they make Bexsero available to UCSB students. With a 10% fatality rate, this is not an appropriate response. The issue with the strain of virus present in the UCSB students who developed encephalitis is outlined in the quote from the following (LATimes, http://articles.latimes.com/2013/dec/13/local/la-me-meningitis-vaccine-california-20131214), below. The UCSB B strain isn’t even the same as the Princeton B strain. Since the mechanism of activity by the Bexsero vaccine targets protective layers of proteins, since the vaccine has not been licensed for distribution, and since the mechanism the developers THINK will allow the vaccine to both destroy the virus protein while NOT destroying the rest of our cellular protein, I think a little bit of caution needs to be considered here. While the vaccine may not have caused problems with Princeton students, the long-term impact cannot be known. Coming up with antiviral vaccines is not an exact science, and since there have been just a few encephalitis victims at UCSB, and since the last known onset of encephalitis in a victim was over a month ago, IMO, caution in using an unlicensed and untested vaccine should be required. “A vaccine that prevents four types of meningococcal disease — A, C W135 and Y — is administered routinely to children 11 or 12 years old, with a booster offered at 16 to 18, Hudson said. But it has been difficult to develop a similar vaccine against type B, said UCLA professor of pediatrics Dr. James Cherry. The meningococcal vaccine currently in use stimulates the body to create antibodies that target a sugar envelope that encases the bacterium that causes the illness. But because the sugar envelope in the type B bacterium is very similar to sugars in various cells in the human body, there have been concerns that a vaccine that worked the same way would stimulate the body to attack its own healthy tissues. Bexsero avoids that problem by targeting surface proteins in the bacterium instead of the sugar envelope around it, Cherry said. Infuriating. Obfuscating. They are waiting for another student at UCSB to fall ill before getting the vaccine program up and running. He claims that the “vast majority” of outbreaks stop after 2 or 3 or 4 cases. In prior public statements he estimated the risk at 2 out of 13, or 15%. In my private conversation with Dr. Cohn at the CDC, she targeted that estimate to include specifically outbreaks on college campuses and told me that the risk of a prolonged outbreak was 2 out of 4, or 50%. Their choice to watch and wait may be a pure motive in the realm of epidemiologic science, but it’s utterly immoral. They are acting responsibly by being cautious in releasing a vaccine which has not been tried on this particular strain and, if something goes haywire, could outright kill those who were given the vaccine. Proteins are an important part of what makes us tick. In fact, we can’t tick without them. Unleashing an untried, unlicensed vaccine that attacks proteins is the drug industry acting responsibly for a change.